So the trailer got skunked again tonight. I saw the little critter roaming around outside the back door. This time I figured if I made a lot of noise he’d just leave. I turned on the back door light and saw him and Momma Cat fighting. He did eventually take off with the sound of some noise but he sprayed in the mean time. The last few times the smell was way to powerful to even sleep. This time I concocted something potent yet amazingly awesome to remove the smell. It’s amazingly simple and it just works. I took about half a cup of coffee grounds and half a cup of sugar and I placed it into a flat skillet, you dont want to use a teflon skillet as its not safe. I turned the burner on high and burned the coffee and sugar till it started to smoke something potent. I then carried the burning mixture into every room. I continued this pattern for around 10 minutes walking the length of the trailer over and over again until the coffee and sugar incense had overpowered the skunk smell. Within minutes the skunk musk was gone. I plugged in the Mr. Fabreeze plugin, and opened a window and now it’s all fresh again and I can breathe again. I’m sure Mrs. Skunk is pissed that I have outsmarted him. Next getting rid of El Skunko Madre she’s a bright one so it’s not going to be easy. I’m thinking we may have to trap this one. I wonder why the skunk keeps coming around. Do you think that this skunk is maybe drawn to the mama cat who lives at your trailer? You know, like how when Pepe Le Pew fell in love with the cat on that cartoon? Could be he comes around to play with the mama cat, then she gets pissed and they get into a fight, and then he sprays. At any rate, I think you may have come up with an invention that will change history, cuz on that show “Myth Busters” I recently saw them trying out various remedies for counteracting skunk smell, and they did not use any thing that worked as well as your coffee-sugar incense. 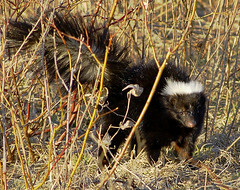 I think its the same blasted skunk and he/she does fight with the mamma cat not sure what their relationship is.